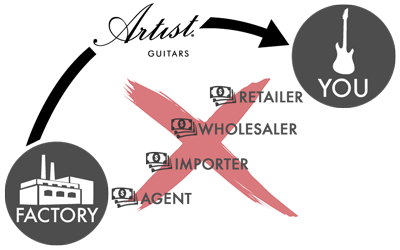 Why Buy from Artist Guitars? Which guitar is best for a child? Your shopping cart is empty.Add items to your cart and they will appear here. Which gutar is best for a child? Shop safe at Artist Guitars. We offer Free Shipping on our entire range, regardless of price, anywhere in the UK. If in the rare case that something goes wrong during the shipping process, you're completely covered. Our shipping is fully insured so you're guaranteed to get exactly what you paid for. We understand that it's difficult to make a decision to buy online when you can't physically see, feel and play the product. That's why we offer Free Returns for 100 days. If you're not happy with the product for any reason, we'll happily exchange or refund the full purchase price and we'll even pay for the return shipping! We're so confident in the quality of our instruments and accessories that we offer the best warranty in the industry! We'll repair or replace any manufacture fault for up to 3 years. This applies to all instruments and accessories, excluding consumables. See more info here. Building on over 30 years of music retail and manufacturing experience, Artist Guitars have been proudly operating in Australia for over 6 years. 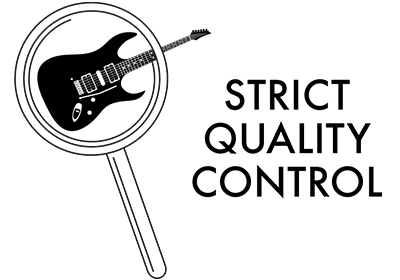 Our guitars and accessories are designed in Australia by the Artist Guitars team and with the help of local luthiers and our loyal customers. After well over 200,000 orders, we are now Australia's most trusted online music store, with 4.9 stars on Google Trusted Stores, 99.9% Feedback on Ebay (over 66,000 reviews). Many sellers of low-cost guitars keep their costs low because they buy directly from the factory without paying attention to the quality of their output. At Artist Guitars we work very closely with our factories and have a full time Quality Control Officer who oversees the stringent checks over every single instrument that leaves our factory. You can see Leo at work here. You won't find this level of care and attention to detail from any of the budget guitar sellers on the market, particularly those guitars you can buy through department stores! Our instruments and accessories designed in Australia, manufactured at our factory in China, then shipped directly to you from our UK warehouse. Don't be fooled by our low prices! We are not selling an inferior product. We just prefer to supply quality instruments and accessories direct to you, the customer, rather than pay the middlemen that are normally involved with popular brands. You may find it hard to believe, but the techniques, components and materials used to build our guitars are the same quality as instruments you may find in a retail store for more than double the price! To read more about the Artist Guitars story, see our About Us Page. Good value item, and good service, thank you. Looks like you're in Country. Would you like to visit our Country site?